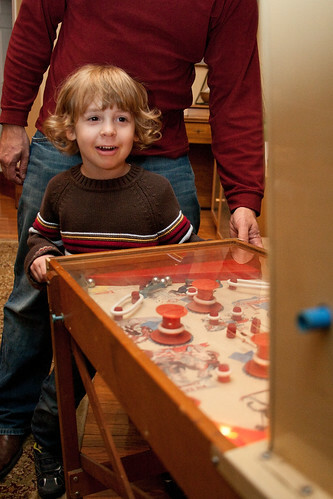 Tristan turned 5. Five! I can hardly believe it. He’s gotten taller, thinner, and very few traces of the baby he was are left. I can get all weepy just thinking about it. 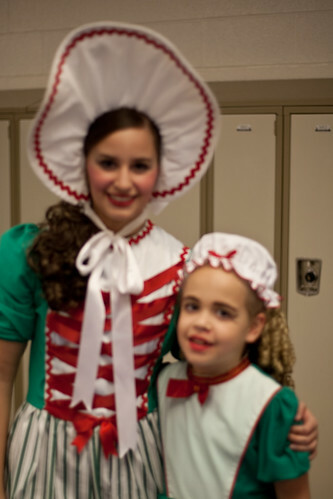 Katie was the cutest gingersnap to ever grace the stage. Just a few weeks ago the choreographers asked if she could be in four performances instead of the planned two and she did incredibly well with the added commitment. That girl loves to dance. I’m sad that photo up there is blurry but it really is indicative of the weekend, an enormous ballet blur. 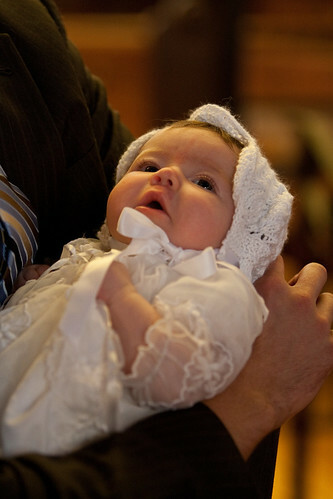 My newest niece was christened last Sunday. Seeing your baby brother as a father is really a remarkable thing. He is head-over-heels in love with that baby girl. I knit that bonnet — twice! but more on that later — so her little wet head wouldn’t get cold. Lots of other things happened since we’ve chatted last but those are the highlights. So what have you guys been up to? A couple of weeks ago I started thinking about which sweaters I am going to knit for the urchins for Christmas this year. I’m thinking Boys Can Wear Pink and Sourpatch, coincidentally both from Petite Purls. But I realized that poor Tristan’s sweater from last Christmas was never finished. Bad Mama. So, I decided that before I could start this year’s sweaters I really needed to finish last year’s. I’m so glad I did because my boy wanted to wear it all day even thought temps were in the 90s. The pattern is SK8R from Mason-Dixon Knitting Outside the Lines and knitted in Rowan Denim. I got six balls of it as a free gift for being a Rowan subscriber a few years ago and bought one more from another knitter on Ravelry. Well, I hadn’t quite finished the second sleeve and ran out of yarn! I put in a plea for anyone with the right dye-lot on the Rowan group and someone who also received it as a free gift sent me the extra skein that I needed. Thank goodness for Ravelry. After sewing all the pieces together I washed the sweater in hot water and dried it in the dryer. It shrunk up nicely and is still a bit big on my size 5 boy — the pattern calls this a size 4-6 — so I think he should get a couple of years out of it. Click through to the project page if you want more details. I can’t tell you how happy I am to have a finished knit for me that I love. You may recall how Juliet didn’t end well and that was the last knit for me. Shalom was a different story altogether. 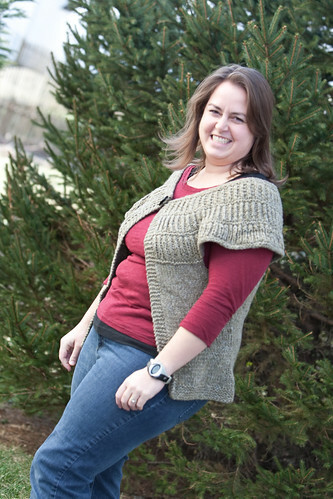 I altered the pattern a bit — details on ravelry — because it is written for one small size only. If I were making another — and I am not ruling out that possibility — I think I’d cast off fewer stitches for the cap sleeve and leave more stitches for the body. The yarn is Rowan’s RYC Soft Tweed in a sage-y color. I loved working with this yarn and was very happy with how it washed and finished. 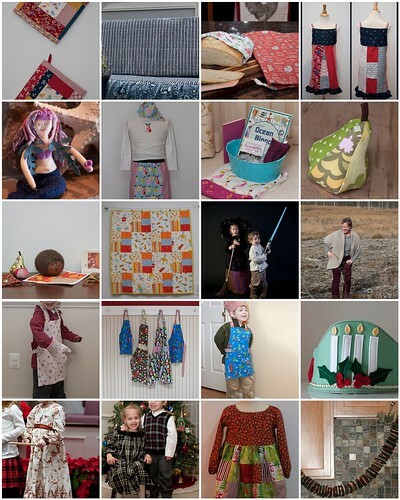 Especially since this pattern is free I highly recommend it if you are looking to make a really great sweater. And if you are looking for some inspiration try these made by Melissa (and this one, and this one too), and by Gwen, and by Liz, and by Amanda, and by Laura for starters. We spent the weekend celebrating the christening of a good friend’s baby at the Jersey shore. We had a great time hanging out with friends we don’t see nearly enough. It was just like when we were in college except now we have a whole bunch of little ones to watch out for. So strange. As for the giving it seemed to me that a bonnet and booties set was in order for this sweet little girl so that’s what she got. Both were knit from Jaeger Roma — which I love and got on sale — in cloud (015) and blossom (011). I used Larissa‘s Feather and Fan Bonnet pattern and this Mary Jane Booties pattern. The gauge/yarn produced a small bonnet, just right for a two-month old head and the booties were also a perfect fit. You can find the details on the ravelry project pages but for the booties I switched colors on row 16. This is the same baby who now possesses last year’s February baby sweater and in the few moments I was able to steal her away from her adoring aunties and grandmother we were able to get a photo of her in all the handknits. Sweater, bonnet, and booties, I think she’s all set. To be honest, I’m not too pleased about the knitting. I intended to knit through EZ’s Knitter’s Almanac and did not get very far. In fact the February Baby Sweater is the only completed project from the book. I’m hoping to change that in 2010. I think there was a lot of starting in 2009, not so much finishing, I’m hoping to improve in 2010. 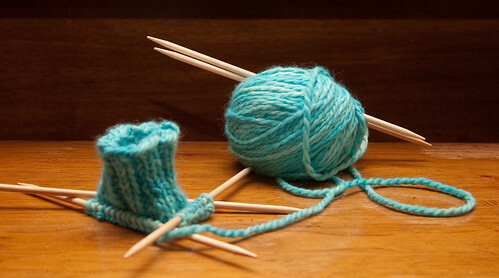 Dare I say that going into 2011 I’d like to have no WIPs in my knitting basket? The sewing however, required two mosaics so that’s something. Katie alone got about a dozen new outfits made by her mama. That is something that makes me exceedingly happy. I also finished four quilts in 2009. I have a whole bunch of quilt tops ready too so just like the knitting, I need to finish what I start. This may be a theme. I made a lot more of the gifts the urchins give their friends so I would like to continue that trend in 2010. 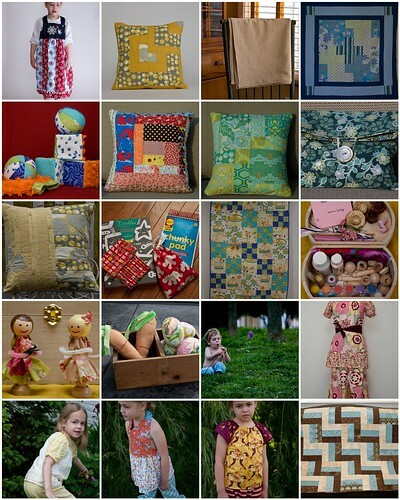 In fact, I’d like to try to get a stash together so I’m not always sewing at the last minute. And then there’s the food. We ate mostly locally at almost every meal this summer and at many of our meals in the other seasons too. I canned so much — so so much — and looking at those jars makes me so happy. I remember one week in August where I canned something every day. We found a dehydrator on craigslist and expanded our repetoire to include dried food as well as canned and frozen. 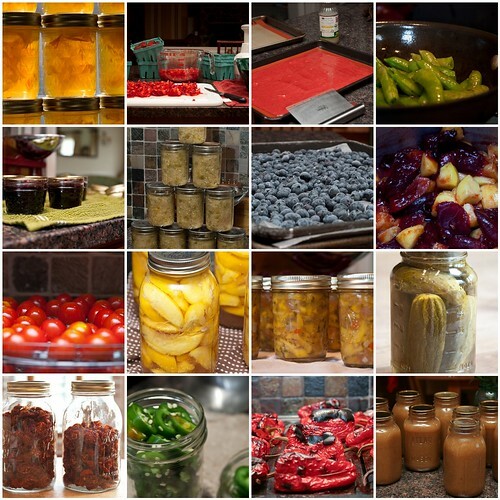 I canned jam and salsa, whole fruits and sauces, sweet and savory. We had to figure out a new system for storing it all. We’ll be eating well all winter I’m sure. In fact, on one of those stressful days before Christmas I realized I had gumbo in the freezer that I made back in the summer and it was so good. But 2010, I have big plans for you. Plans that include expanding the garden and the pantry. Plans that include covering all the members of my house in their own quilt. But more on that later, for now I think I’ll just look at what was good in 2009. Friday was Tristan’s last day of preschool before the break. Katie was supposed to have her last day of school today. I say supposed to because on Saturday we watched the snowflakes come down and keep coming down until we had over 22 inches on the ground. 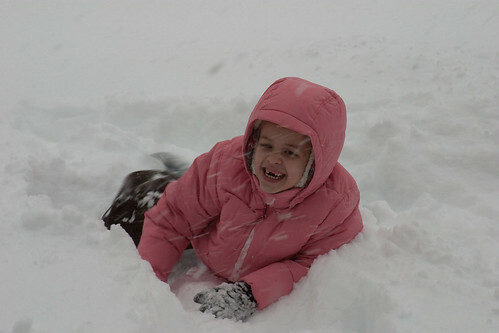 Our county is largely rural and so the school system canceled classes for this week knowing that there was no way to get the schools and roads dug out in time. So, Tristan took gifts for his teachers on Friday and Katie’s teacher will get a New Year gift instead. As in years past the urchins dyed yarn in their teachers’ favorite colors. This year we used kool-aid — an awful lot of kool-aid to get the saturated colors we wanted — in a squirt bottle for the photo that we include on the tag and we also dyed the yarn in a pot as well. 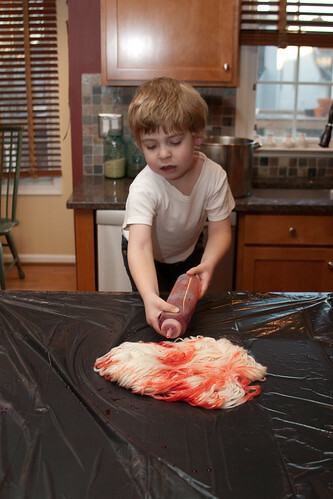 Tristan’s teachers like burgundy and red so we used black cherry and cherry kool-aid. 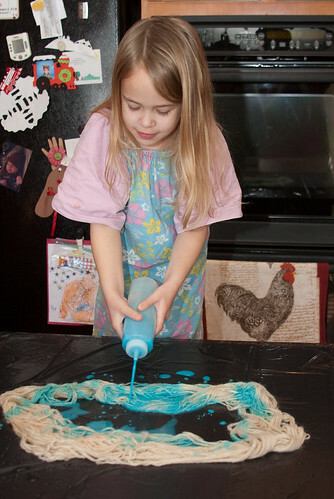 Katie’s teacher likes blue so we used ice blue raspberry lemonade. Since Katie’s haven’t been delivered yet they may get overdyed to a darker blue before they do since I am not happy with the color they are presently. I improvised the pattern. I’ve made a lot of mitts so I just needed to figure out how many stitches to cast on — 28 for those wondering — and could go from there. I knit 10 rows of ribbing, 5 rows stockinette, increased for the thumb gusset, separated for the thumb, 5 rows stockinette and 5 rows ribbing and then bound off. I picked up the thumb stitches and 4 stitches from the mitt, knit 2 rounds and then rib for 3 rounds and bound off. 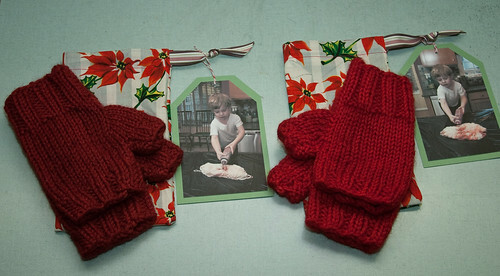 Easy peasey and all four mitts for Tristan’s teachers were made in one day with plenty of breaks. I’d say they require about 90 minutes per pair. Bulky yarn is the way to go for quick projects. I think his teachers were happy with their gifts and they both have tween-age children they could give these to if they don’t think they’ll wear them all much. 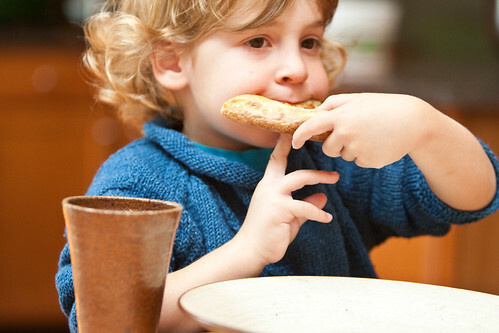 The urchins love making them, that’s for sure. I think we’ll be doing some more dying soon. 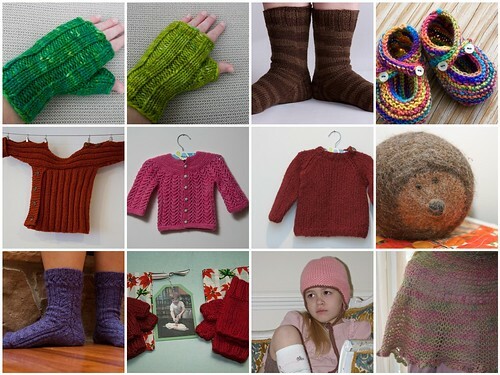 I just loved knitting Kristen‘s mystery socks for 2009. I may start trying to knit socks this way in the future — knitting both cuffs, then both legs, etc. — because it gets them done, both socks, pretty quickly. These are for my grandmother and so they are a bit big on me, which is good since she has bigger feet than me. 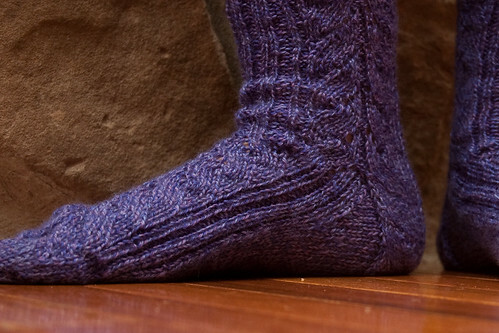 Kristen’s pattern is wonderful and the details in the socks are really great. So one Christmas gift done, a whole bunch more to go.